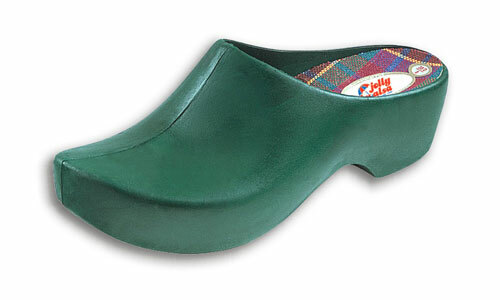 Classic Jollys Clogs are the trendsetter among all-weather shoes. The unusual but traditional "wooden shoe" shape and the joyous Easter-egg brilliant colors have been discovered by millions of devoted friends. Whether mowing the grass, washing the family car or working in the garden . . . there's no end to the occasions where wearing your Classic Jollys is "just the ticket." Inside or out, in rain or sunshine, you're always wearing the right shoes. 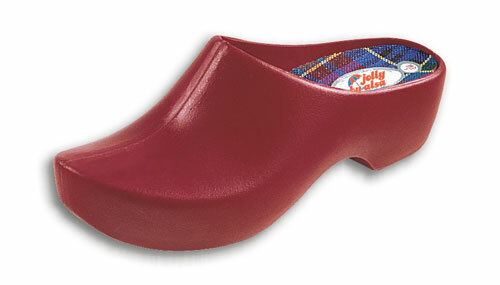 Classic Jollys are easy-on, easy-off, easy to clean and nearly indestructible. Classic Jollys are the ideal leisure-time shoe for the entire family. your Classic Jollys are true all-weather shoes to protect your feet from moisture and dirt. Classic Jollys are FUN! They'll make your feet happy! The secret is the anatomically shaped removeable foot-cradle, developed according to orthopedic principles and made from natural materials. To renew its freshness, the insole may be washed periodically.